We manufacture Scratch N Sniff products, to meet the custom demands of our clients. Since 1975, we have printed over 100 Million Impressions. Choose from our classic "Scrach N Sniff", or our new "Rub N Sniff" technology. Contact us, and we can work with you to develop products to meet your needs. Our special process utilizes Encapsulated Micro-Fragrances with full color printing capabilities. 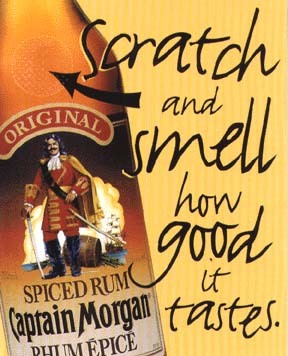 The Scratch And Sniff printable surface can be applied to just about any product or paper surface. Our Scratch N Sniff product line inludes stickers, books, business cards, printed inserts, clothing, and more. Consult us for all of your needs, we are Scratch N Sniff experts! NEW: Now you can link to us directly through www.ScratchNSniff.com To bookmark this site please press 'Control + D' on your keyboard. The Print Box Inc. Since 1975!